This specimen was found on a tapelift from a home in Cleveland, Ohio. There was a very significant population of these mites in this home. The male can be distinguished from the female by its very large, grasping, fourth pair of legs. These are visible in this photograph directed straight back from the mite and arcing together behind the mite in the upper part of the image. The head of the mite is facing down to the left. KINGDOM: Animalia PHYLUM: Arthropoda SUBPHYLUM: Chelicerata CLASS: Arachnida SUBCLASS: Acari SUPERORDER: Acariformes ORDER: Trombidiformes SUBORDER: Eleutherengona SUPERFAMILY: Tarsonemoidea FAMILY: Tarsonemidae GENUS: Tarsonemus Mites or their debris are found in indoor environments frequently. They all tend to be small ranging from about 40 micrometers to about a millimeter in largest dimension. They lay eggs and then develop through a number of intermediate stages. The adult mite has 8 legs but the intermediate stages may have 2 to 8 legs, depending on the species and the stage. All mites require a relative humidity above 50% but they will often occupy cooler parts of a home where the relative humidity is naturally higher. They will also inhabit bedding and clothing where the relative humdity is elevated due to the presence of the human body. Their prefered food varies by species. Many of them will survive on skin flakes. 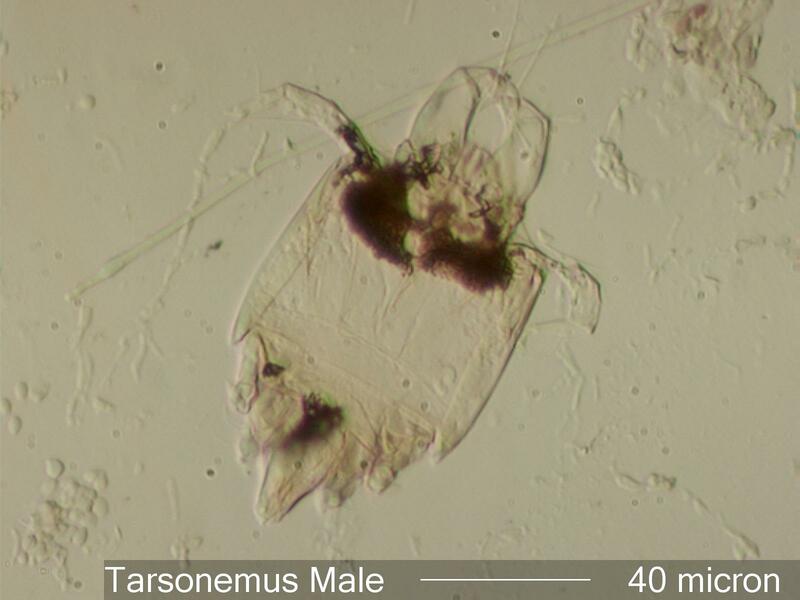 Tarsonemus mites are rather small compared to many other mites found in homes. The main part of the body excluding the mouth parts, the idiosoma, in the male is typically around 70 micrometers long and clearly divided into a forward section, the proterosoma, that contains the first two pairs of legs and mouth parts, and a posterior section, the hysterosoma, that includes the last two pairs of legs. The male Tarsonemus mite can be distinguished from the female by its very large, grasping, fourth pair of legs. The main setae protruding backward from the fourth leg are birefringent.